Young and smart, they knew exactly what will cause me to spring out of my chair and rush outdoors. I could make out they were daring me, that unmistakable, distinctive sound, as they pranced around on my guava tree. I peeped out from the window. Wearing green coats and oblivious to the havoc they were causing, they were prancing in sheer delight at the sight of so many guavas. The fruit was so enticing, not fully ripe, making it all the more important for them to steal some off the tree! I reached out for my phone to click the little thieves in the act. They turned around as I opened the door, unperturbed by the click as the key turned. Nonchalant, they carried on without missing a step. It was as if my presence was no deterrent, determined as they were to get at the fruit. Let me confess—I’d initially thought I was dealing with only one thief. The sun was in my eyes, but I tried to click the one who’d called, and who continued to make small screechy sounds. The other made no sound, ambling from one branch to the other as it scouted coolly for the best pick. The presence of an accomplice was a stunner. I literally stopped in my tracks and forgot I was there to take pictures. 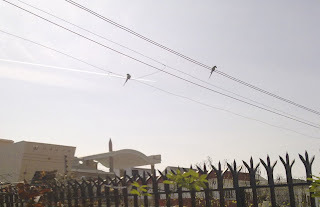 I’d meant to catch them red-handed, but who can catch red-beaked thieves that take wing with hurriedly snatched fruit and then dare you from their perch on the overhead cable! Yes, indeed, these two feisty parrots stole a march over me, and stole fruit from my tree as well. I loved it all: the teasing call, the mocking, daylight robbery and the revelry up in the air that followed as I watched them from my lawn...helpless, yet happy.